It looks like the fans of UPGRADE are in for a swell 2016 as these fresh teen boys celebrate their anniversary concert on November 5, 2016 at The Music Hall in Metrowalk in Ortigas. They've already gone way ahead of their viral "Trumpets Dance Challenge" videos (which have amassed 10 Million total views on social media by the way) and now has been enjoying guesting in several top rating shows like ABS-CBN's Gandang Gabi Vice, It’s Showtime and the morning show Umagang Kay Ganda. All throughout 2016, they will also be doing concerts in Manila and nearby provinces showcasing their knack for dancing and singing too. Those little girls and boys of yours would love it. Aside from that, they'll have special guests like Edray Teodoro who did The Voice Kids Philippines Season 1 and a lot more surprise guests. 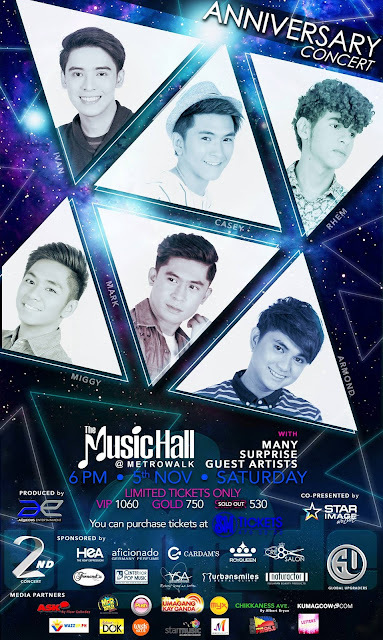 The GILING AMBASSADORS will be doing concerts as well in the Bicol region at the famous Albay Astrodome, same place where Darren Espanto is doing his "The Total Performance Concert" this coming December 3, 2016 too. This will be produced by Daylight Events and tickets are already sold via SM Tickets, or call 4702222, 9061555, 9060555 or 09168710223 if you are interested. The tour will also happen in Nueva Ecija, Pampanga, Laguna, Marikina, General Santos City, Quezon Provinc and a lot more other places where Global Upgraders are present. They are so thankful for the love and support they are getting from their fans, ABSCBN and shows that have already guested them like ASAP 20, ASAP ChillOut, Rated K, Sports U, Salamat Dok and radio stations MOR 101.9, WISH FM, Pinas FM and Energy FM. They would also want to thank their sponsors who have steadfastly believed in their talent all throughout the year and beyond. From Aficionado Germany Perfume, Royqueen Gadgets, Unisilver Time, Hea Watches, Ysa Skin and Body Experts, Cardams Shoes, Cre8 Salon, Naturactor MakeUps by Japan Beauty Product, Urban Smiles Dental Clinic and legendary voice and performance school Center for Pop Music. They would also like to send thanks to their Artist Management and Producers Star Image Artist Management, Vince Abasolo and David Cabawatan who has been always behind them through Aqueous Entertainment. This is just the beginning for these talented teens, they will be seen more on upcoming endorsements, TV shows and who knows, perhaps another recording in the works if fate tells them. I'm sure you're excited to see them all dance to more hits very soon! They won't hold back because UPGRADE will still surprise you in the last quarter of 2016!